While dismissing a call by the opposition for a million march on the capital, Prime Minister Imran Khan Monday said he is confident that the people will not come out on the streets to defend some corrupt families. “There has had not ever been even a single public movement in the world which was driven only to protect the corruption of a family,” Imran Khan said while talking to media here at the PM Office. “We did hold protest demonstration for four-and-a-half months, but it was against issues,” he said. “The opposition on the other hand wants to cover up its money laundering cases while some want to hide under the garb of medical treatment,” he added. Offering his specially designed container truck for the long sit-in before the Parliament House, Prime Minister Imran Khan said the Pakistan Threek-e-Insaf launched its movement against the electoral rigging and later protested on the Panama Papers issue. The prime minister said he wants NAB to target the top men involved in corruption rather than singling out the corrupt at the lowest tier. “You can only eradicate corruption when you get to the men at the top,” he said, and added the Supreme Court too raised the same issue with the NAB. When asked whether former Prime Minister Nawaz Sharif will be allowed medical treatment abroad, Imran Khan asked, “Under which law can he be allowed to proceed abroad?” He said hundreds and thousands of prisoners are already in various jails and there has to be justice. Imran Khan said he always believed in the rule of law and quoted a Hadith of Holy Prophet (Peace Be Upon Him), stressing that the powerful in a society cannot be given preference over the less fortunate. “The PML-N government remained in power in the Punjab province for around 30 years, and they could not build even a single medical treatment facility to cater to the illness of their political elite,” he said. “They can build their factories and business empires, but they cannot build hospitals,” he regretted. Imran cited the examples of absconding former finance minister Ishaq Dar and other family members of Sharif family, who always had their medical checkups and treatments abroad. “I will not like to be blackmailed that there is no medical doctor or hospital in Pakistan that cannot provide the requisite treatment,” he said, and added the best possible facilities were already being extended to the former prime minister. Imran recalled his long case of Banigala property and said he provided every document asked by the Supreme Court. However, on the contrary, the former prime minister did not provide even a shred of evidence to prove that he has nothing to do with the Avenfields apartments, he added. To a question about ongoing cases in the National Accountability Bureau (NAB), he said his government has nothing to do with initiating the cases of money laundering against the Pakistan People’s Party (PPP) leadership. He said the cases were initiated in 2016 by the Pakistan Muslim League-Nawaz (PML-N) government. He said former interior minister Chaudhry Nisar wanted to probe fake bank accounts in the wake of arrest of model Ayan Ali, who was caught trying to smuggle foreign currency abroad. Imran Khan said his government will be launching the country’s largest comprehensive poverty alleviation project on March 27. He said with the input from China, he is looking forward to undertaking measures to fight the rampant poverty. Regarding the role of opposition in the parliament, Imran Khan regretted that they are not taking democracy seriously. “They want to have a NAB accused as head of the Public Accounts Committee and use the parliament to cover up their misdeeds,” he said, and added the people pay for holding of parliament session and each minute costs the nation around Rs 80,000 to 90,000. The prime minister, when asked about the performance of his cabinet, said he along with his team has attended more cabinet meetings than those of Nawaz Sharif in his five years tenure. When asked about the performance of chief ministers of Punjab and Khyber Pakhtunkhwa, Imran Khan said they understand and realise the problems of the masses. He said Usman Buzdar is being compared to former Chief Minister Shehbaz Sharif who has been in power for past 30 years and the province incurred losses in billions. “Let him give a chance. They stand with our mission,” he said, and added their performance is satisfactory. Imran Khan said his government inherited Rs 30,000 billion as loans when it came into power while the PML-N inherited Rs 15,000 billion and the PPP faced a deficit of Rs 6,000 billion. The Rs 6,000 billion figure, he said, is equivalent to the total loans the country had borrowed since 1947. The prime minister said Pakistan will not need to import oil if reserves are found near Karachi’s seas. “We are hopeful of finding large reserves of gas and oil in the sea near Karachi. The nation should pray for this and I will soon share good news regarding this. God willing the reserves will be so large that we will not need to import any oil,” he said. The prime minister said he has managed a cut of Rs 350 million in the expenses of the Prime Minister Office and said he shifted to his private residence at Banigala and is paying from his own pocket the salaries and expenses. He said the PTI raised Rs 6 million on its own to construct the fence around his residence and the road from his residence to the main road was also constructed through his own resources. He said he is paying the expenses of Zaman Park residence also from his own pocket. The prime minister said Pakistan is pursuing one of the best foreign policies in two decades and the United States has now come to acknowledge its role in bringing peace to Afghanistan. He said since coming to power, his government has pursued good and stronger relations with all countries and in particular with those in the region. He said Pakistan now enjoys exemplary ties with Saudi Arabia, the United Arab Emirates, China, Turkey, Malaysia and many more and is desirous of further improving these relations in the days ahead. He, however, pointed to the ‘war hysteria’ created by the outgoing government of Prime Minister Narendar Modi as the Indian general election is just round the corner. “We have concerns and Pakistan needs to keep a full vigil till the election process is over in India,” he said. To a question about the remarks of US President Donald Trump in which he said both Pakistan and the US have good relations and that he will meet Pakistani leadership, Imran Khan said Pakistan is examining the statement. 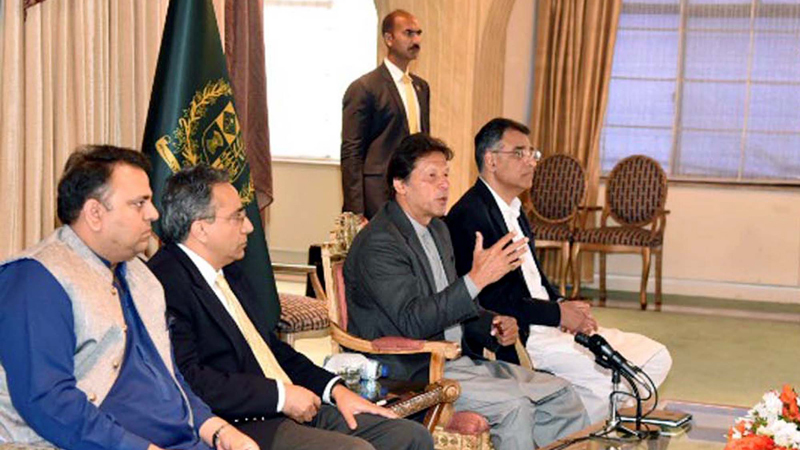 Imran Khan was flanked by Information Minister Fawad Chaudhry, Finance Minister Asad Umer and Chairman Task Force on Energy Sector Reforms Nadeem Babar. Speaking on the occasion, Asad Umer said there has been progress in talks with the International Monetary Fund (IMF) and the two sides have managed to bridge the gap between their points of view. “Today we are much closer to the IMF,” he said. He said the position of IMF has changed, while that of the government of Pakistan remains static. He said during the talks, the IMF informed that the terms of their agreements were much softer in 2008 and 2013, as the situation was far better than it is today. The PPP government had four-and-a-half months of reserves, the PML-N had reserves of seven months and 20 days while the PTI got only 15 days of reserves, he added. He said the new IMF chief will be visiting Pakistan on Tuesday (today), but said it is not for formal talks.